You’re competing for jobs with kids from India and China. I think schools should be open six, seven days a week; 11, 12 months a year. 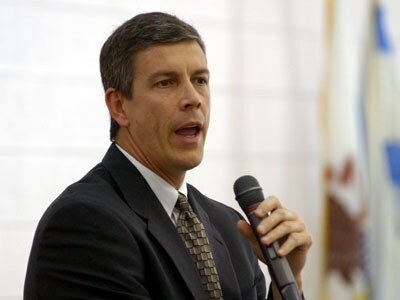 Arnie Duncan was nominated to the Secretary of Education post by President Barack Obama in mid-December last year, and smarter men than me immediately called foul (See Gary Stager’s “What Do Arne Duncan & Paul Bremer Have in Common?). I wanted to give Duncan the benefit of the doubt, but all doubt’s gone now. We’ve gotten no where and we’re going nowwhere, especially if we are going to extend the sentencing of our children. ..the competition we have vs. India and China (2 Million … Read MoreMinutes) is an impossible task to overcome. Those are the best of the best compared to our better kids. I would extend this mismatch to suggest that it isn’t simply that we’re comparing their best apples to our better apples. First of all, you’re not going to win the blue ribbon at the county fair by leaving your apple pie in the oven longer. And secondly, why not grow oranges instead. Doesn’t a global market place need diversity of talents and skills — not everyone trying to best each other on the same narrow array of standards. Isn’t this what we’re doing to our children? But we’re not talking about fruit are we? We’re talking about our children. ..and let’s face it, we’re talking about nothing less than institutionalizing “child labor” to satisfy a failed belief that higher standardized test scores will reliably lead to a stronger economy, more prosperous citizens, and a vibrant democracy. What it leads to is boredom, ca lapsing morale among our best teachers, children without passion, children dropping out, and a growing and prospering testing industry. I was so incredibly lucky to have gone to school when I did. Even though I did poorly on tests, was not conscientious about homework, blah blah blah (we didn’t diagnose leaning disabilities (diversities) back then). I had wise teachers who said, “He’s bright and he can learn anything he wants to learn.” My parents didn’t worry. My son, who’s not A.D.D., still performed poorly, because he was bored. He didn’t care. He wasn’t drinking the kool aid. He spent his time and attention with his music. I remember when a middle school math teacher refused to sign off on his enrolling in more advanced math classes in high school. She urged us to keep him out of math. The cynic in me is convinced that continued poor math performance wouldn’t have been good for the school. We put him in Math and he performed poorly — until he approached his senior year and realized that his grades would prevent him from earning that music scholarship he need for his music school of choice. So during his senior year, he out-performed, in calculus, classmates who’d already been accepted at MIT. Bring passion back into education — and kick out the standards! ..and while you’re at it, kick the amateurs out too! Gandy. Sara. “Education Secretary says kids need more school ,” 9News.Com 8 Apr 2009. 9 Apr 2009 <http://www.9news.com/news/article.aspx?storyid=113300>.